I am posting live from Lexpo 2017, a legal innovation event in Amsterdam on May 8-9, 2017. I post as a session ends, so please forgive any typos or errors in my understanding. The session description appears at the end. 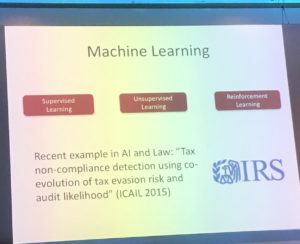 Overview of AI and law research in the academic community. AI is making many headlines. This has happened in past and funding was pulled when promise was not delivering. But we are back, in part because of the publicity around IBM Watson. The latest big headline was Google DeepMind’s AlphaGo (beating the world Go champ). Can these tools be applied to specific domains? Yes, we know it can work in medicine. Here is a rundown of work on AI for law. To solve a problem, one needs to know rules, set-up, and problem to solve. When focusing AI on a domain, start by defining the problem to solve. Obvious questions are who should win a case, what does a contract mean, what does the evidence say, what should the financial settlement be. AI and law is a research area on its own. Some sample titles include “Expert Systems in Law: Out of the Research Lab and into the Market” “Designing Textr Retrieval Systems for Conceptual Searching” These are two of three title presented at ICAIL in 1987. They sill sound relevant today. The community of researchers has been active a long time. There are big difficult questions to tackle still. 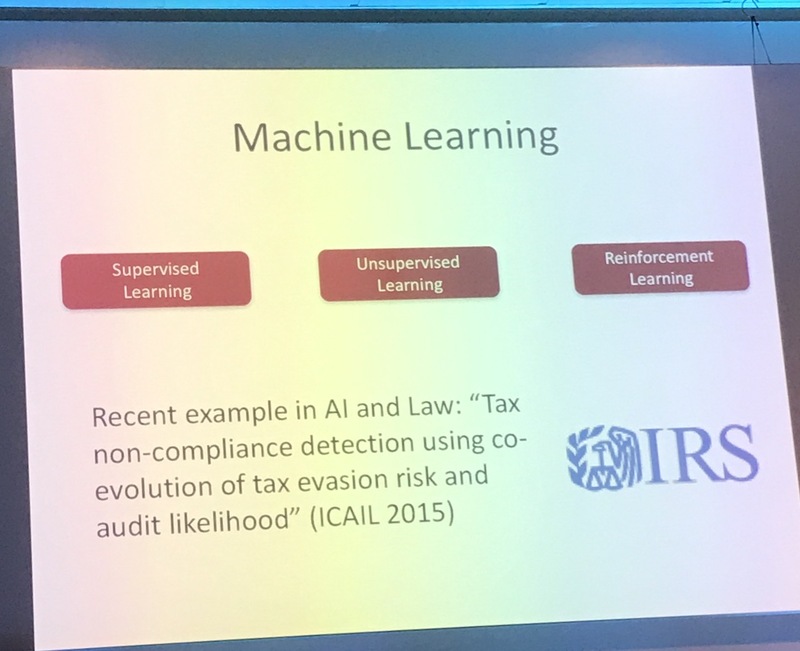 Search and information retrieval: There are lesson from general AI but solutions have been specifically tailored for legal. LexisNexis and ThomsonReuters have had solutions a long time and now moving to cognitive computing. Progress but still work to be done. 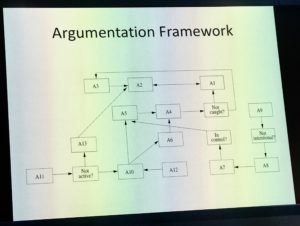 Law as executable logic programs: Logic has long been an AI cornerstone. In 1986, a UK college developed an early landmark piece of work, British Nationality Act as a Logic Problem. It took legislation and used ProLog to turn legal code to computer code. It created a set of If-Then statements to reason to conclusion about citizenship. In 1991, another article about capturing legislative knowledge. It was developed commercially: SoftLaww > Haley Systems >RuleBursst > Oracle Policy Automation. 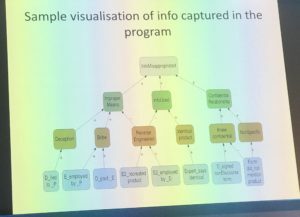 Machine readable languages for e-Justice (A2J): One team did research to determine difficulty of challenging legal statutory standards into code. CodeX at Stanford is also working on making law computable. Machine learning: a “huge hot topic”. Three categories: Supervised means a human categorized approach. Train one half, then use other half of data to test. Unsupervised learning: no human training, machine discovers patterns. Reinforcement Learning: machine gets rewards or punishments for getting closer (further) from right answer. Natural language processing: discusses research to determine if a document contains a trade secret. UCL developed AI to ‘judge’ outcome of trails. Above is just highlight of AI in law rsearch topics. Now, delve deeper into University of Liverpool on explainability of machine solutions. Start with what argumentation means and is. 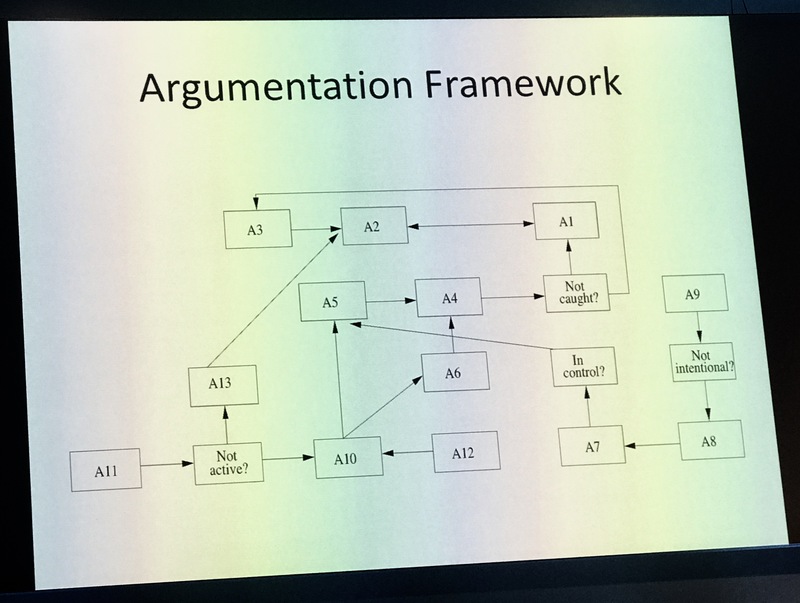 There are computational models of arguments that can capture and understand messy really world arguments to determine the winner. Computer scientists like very precise models. This framework has subsequently been applied to other cases by same research team. The AI has correctly decided 31 out of 32 cases in trade secrets, 5 / 5 in wild animals, and 9 / 10 in auto exception to 4th Amendment. What’s on the horizon? Commercial products are becoming much more prevalent. Academia continues to tackle tough challenges. Governments are starting to get on board with legal tech. Much recent interest in AI in law. Media loves the robot lawyer story. Shows many examples of hype articles. Will do a reset on expectations. Replicating mistakes of AI past. We have been through several AI winders. Suggests we will have an AI winter in law. Too many promises have been made. There is a lot of history of rules based AI in legal market. Does not particularly support this approach but there are specific supports. Tax prep, Turbotax, is the best known example. A more general example is Neota Logic, which tries to mine expertise in head and capture in rules and other reasoning. Dan thinks these systems are perhaps best targeted at people who are not trained as lawyers. Decision trees is main reasoning mode. 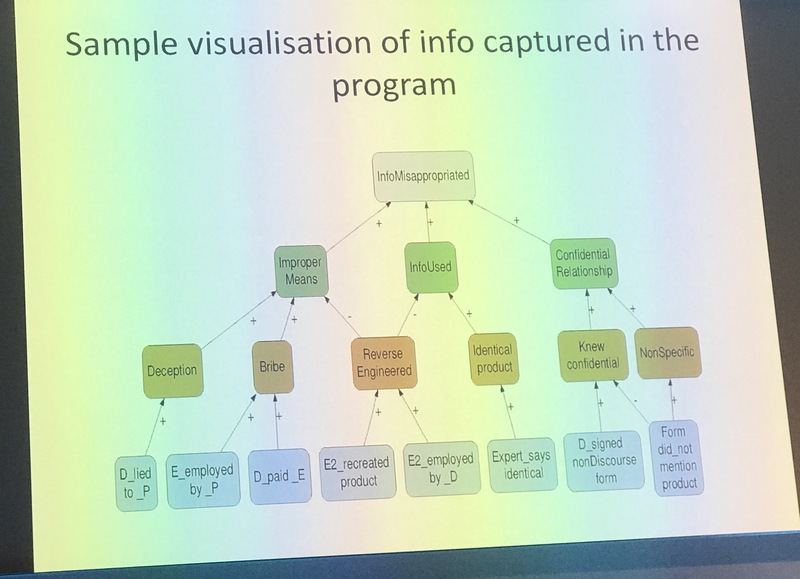 Third example, is from Illinois Institute of Tech, Kent College of Law, which developed tools to provide better access to justice (A2J), a guided interview based on conditional statements and a decision tree. Chicago Kent has had over 3 million uses. Expert systems will, if successful, eventually become a chatbot. Dan is bearish on rules-based systems (expert systems). History is not favorable for this approach. Some successes in other fields but not that many. These systems lack common sense. These systems are static but the world changes. Success requires constant updating. Until recently, rules based systems beat data-based systems. Now, however, data beats rules. For example, way too many rules to capture for driverless cars… but rules can be inferred from large volumes of data. There are some uses cases for rule based systems. There are no Silicon Valley companies doing rules based systems. The AI in the valley is all data based, a lot of machine learning. Dan likes chatbots because they collect a lot of data. They could, with all the interactions captured, rescue expert systems. BigData is the buzzword now. 2008 Nature magazine coined “BigData” and McKinsey socialized it in the executive suite. The pay offs are in medicine, which is way bigger market than law. Finance is another obvious – better predictions make money. In law, making somewhat only a bit better does not do much, in contrast to finance where small edge is big money. Logistics and large scale ag are another big area. Powering Big Data are massive growth in computing power and volume of data. Plus plunging cost of data storage. In 2 to 5 years, a petabyte drive will cost less than $750. AI faces high fixed costs so justifying the conomics in small verticals. Calls law in toto a small vertical but for AI, all of law is not feasible, so we are looking at tiny verticals such as contracts or ediscovery. AI in legal: Ediscovery is most mature. Contract analytics is growing. Negotiation analytics can support the art of negotiation with science and math. Spend analytics. 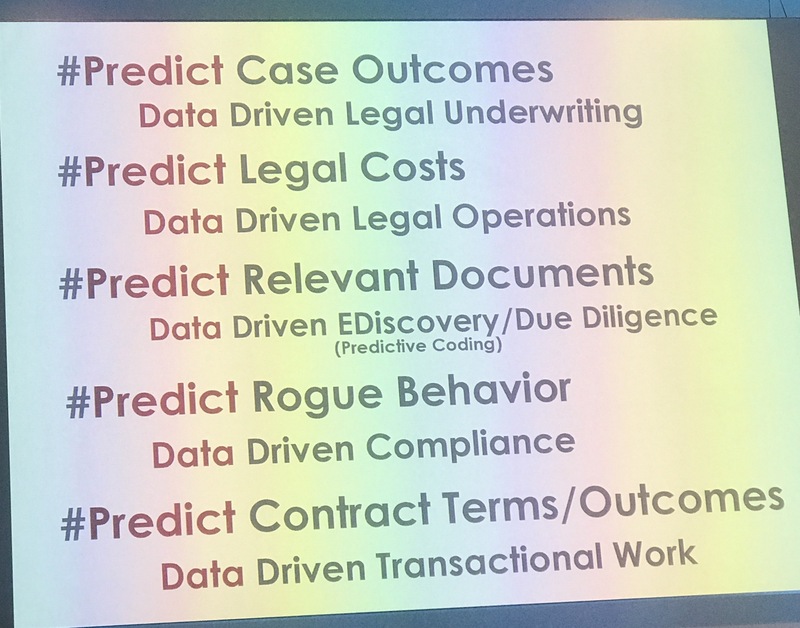 Ideas for the future: predict legal outcomes, legal costs, relevant documents, rogue behavior (compliance). Compliance is the only real BigData problem in law. 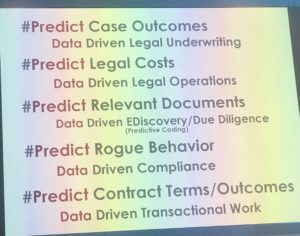 Three forms of legal prediction.. Experts, Crowds, and Algorithms are the three available ways to predict the future. Experts. In finance, experts do not beat market over time. “Tyranny of hunches” often loses versus data. And experts don’t like keeping score against objective measures. In sum, experts have a bad track record. Crowds. In Fantasy SCOUTUS, players can win money. Most of the crowd is terrible at guessing. Dan and colleague run this. A subset of the crowd is very good. The top 25 predictors turn out to be very good (‘SuperCrowd’ beat the best expert.) Expert crowd is best prediction of USSC. A an HBR article by Kahneman explains why crowds are best. Dan’s company has LexSemble, which supports crowd sourcing within an organization. Neil Gorsuch was #1 on fantasy platform from crowd but on no expert’s list. Algorithms. Dan and team published a paper in PLoS on machine learning with time evolution of the approach. Went back to 1816. Algorithm does 72% by justice and 70% by case. Ensembles. Dan believes that blending experts, crowds, and experts is the best approach – an ensemble. Assembling an ensemble is not trivial pursuit. Machine learning as a service (MLaaS) will transform economics. Watson is first example, and not a particularly good one. Watson did on thing well: it pulled many into the market. Commercial example include Google TensorFlow. We have to conquer “The Last Mile Problem”. It was too hard to build product. Today, with MLaaS and many open source enterprise software, conquering the last mile has become much easier and cheaper. Every org will need human capital, people who know about data science. Thinks reality is that law firms will have to grow own talent because buying talent is very expensive. In legal tech, the best is yet to come. The time to build is now.